Want to discover how a small country on the edge of Northern Europe packs an almighty historical punch? 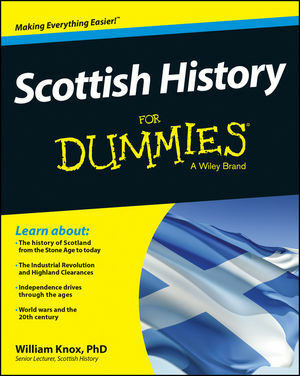 Scottish History For Dummies is your guide to the story of Scotland and its place within the historical narratives of Britain, Europe and the rest of the world. You'll find out how Scotland rose from the ashes to forge its own destiny, understand the impact of Scottish historical figures such as William Wallace, Robert the Bruce and David Hume and be introduced to the wonderful world of Celtic religion, architecture and monuments. If you're a lifelong learner looking for a fun, factual exploration of the grand scope of Scotland or a traveler wanting to make the most of your trip to this captivating country, Scottish History For Dummies has you covered. William Knox, PhD, is a Senior Lecturer of History at the University of St Andrews, Scotland’s first university.